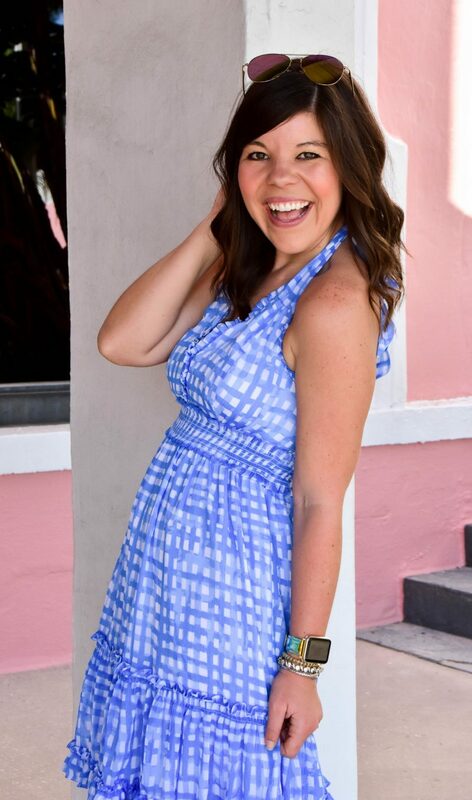 You guysssssss- Spring has sprung here in Florida and it’s heavenly!! I tripped over my Ugg boots yesterday morning while getting ready, so I officially think it’s time to put them away! ha. But I know that my friends in the north might not be as lucky (feel free to come visit!) so today I thought it would be a perfect Friday look to take a winter piece (the sweatshirt) and make it spring appropriate! 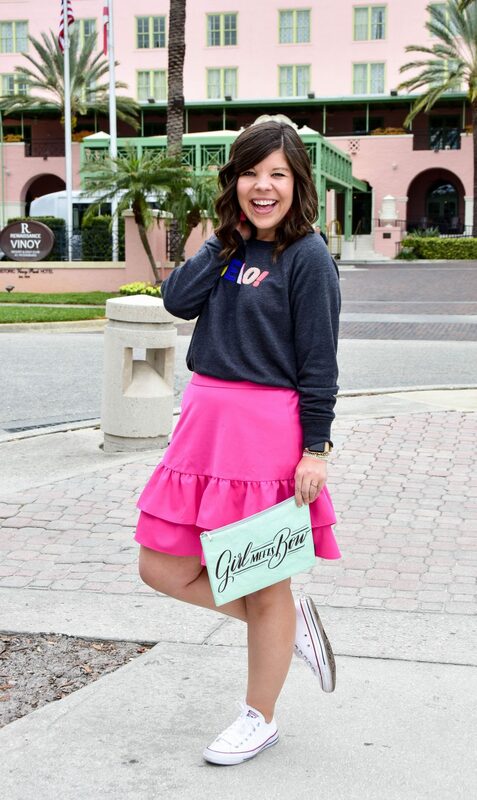 I absolutely CANNOT believe that this sassy pink skirt is still available (& on sale no less!) but when I think spring… I think pink! By tucking this graphic sweatshirt into a skirt, you easily take it from a winter staple (and cosy weekend wear) into a great look for brunch or even office casual if you swap out the shoes! Tonight a bunch of us girls are getting together to celebrate Sarah’s birthday & then she and I are headed out Saturday for a little weekend getaway since her hubby is out of town. Were going someplace neither of us have ever been and are so excited to take y’all along! Any guesses? Next Post Spring Has Sprung in Florida! I tried it the other day and just had so much fun with the look! I love how fun this look is! Especially with the converse, so comfy and it’s a great overall look! I can’t wait to see where y’all are headed for the weekend! We are SO excited to have a fun get-away!!! That top is adorable! I love the bright colors and the fact it’s a sweatshirt makes it perfect for my winter weather up here! Totes adorbs. 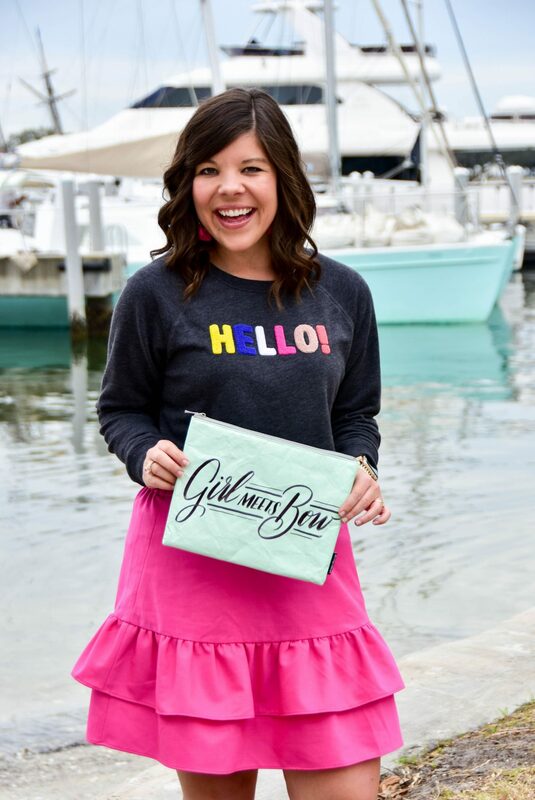 Love the personalized tote. This is such an adorable outfit and I love how casual you made that cute skirt! 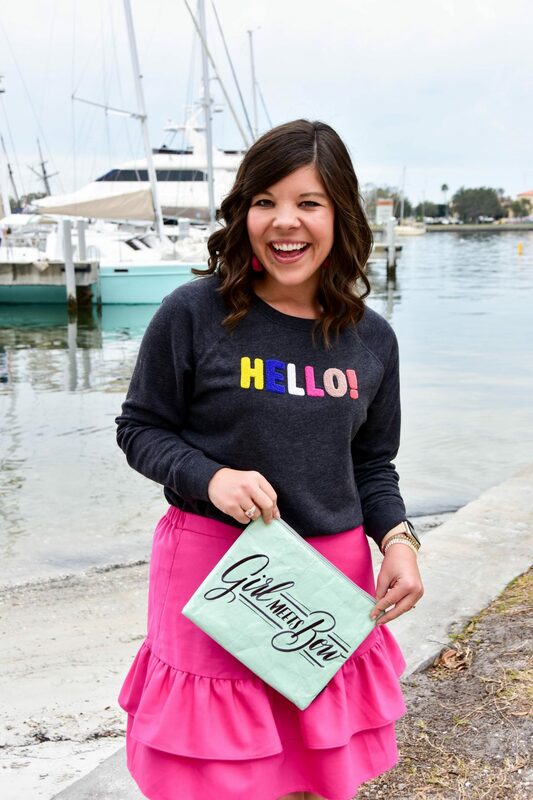 I’m so glad I scooped up this sweatshirt- it’s been a winner this season! 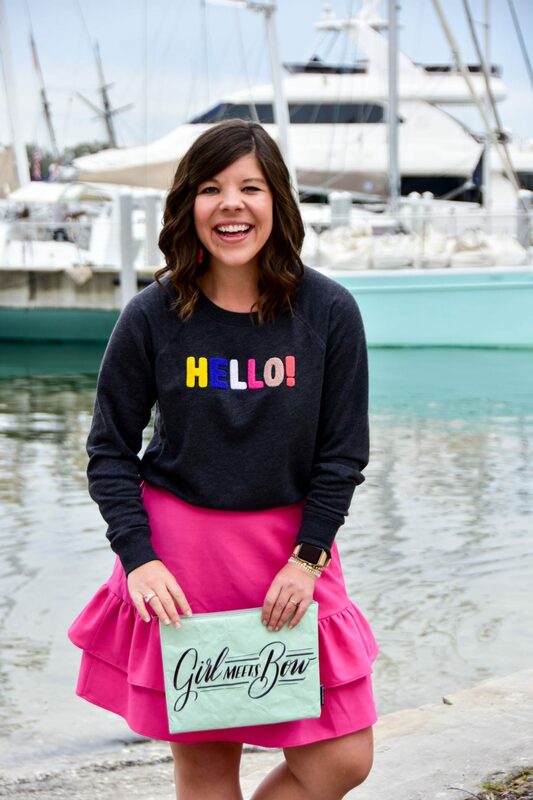 This is easily one of the cutest sweatshirt and skirt combo I’ve seen dear. 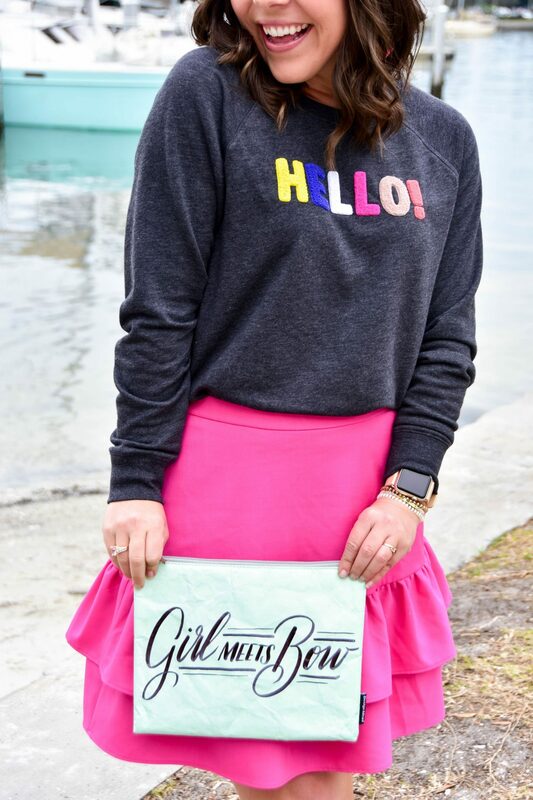 Love the cute pink color of the skirt and the different colors of ‘HELLO’ on grey sweatshirt. 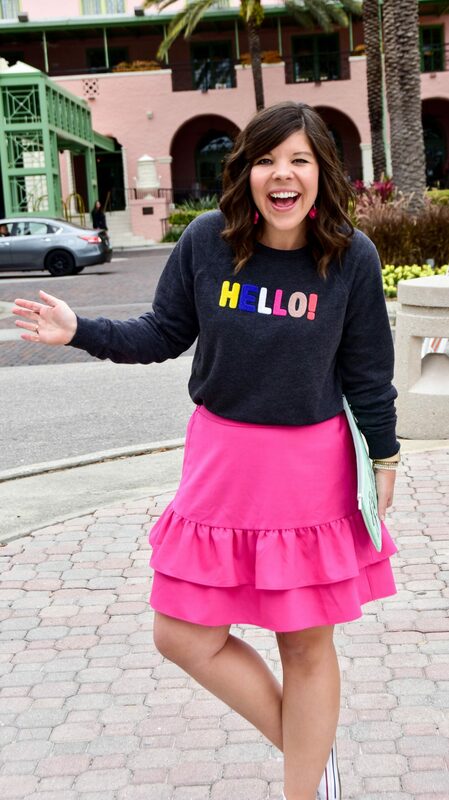 Such a fun outfit!